Thank you to the 132 poets and photographers who participated in the Silver Birch Press WHERE I LIVE Poetry & Poetry Series, which ran from February 1 – March 31, 2015. The series was an amazing adventure around the world. Thanks for a great ride! We’ll post all the participants’ names and the places we visited in a few days. muffling the booms of Bald Mountain. while last night’s security takes a walk. to invade the valley of worn itinerants. unusually cool to the touch. 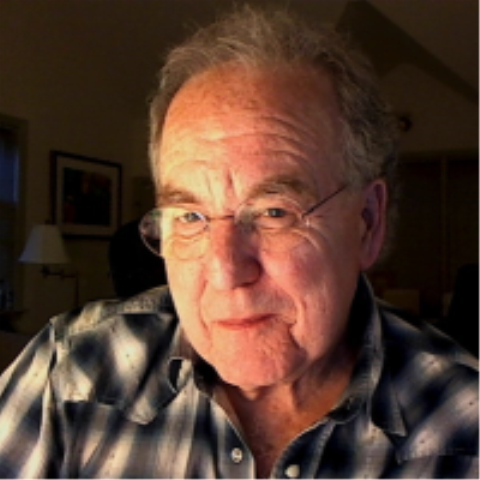 NOTE FROM THE AUTHOR: Though I live in the San Fernando Valley of Los Angeles County, I am never far from a view of the city and its cluster of high-rise office buildings. On this particular day, clouds shadowed downtown Los Angeles while thunder echoed in the surrounding mountains reminding me of Bald Mountain in Fantasia. 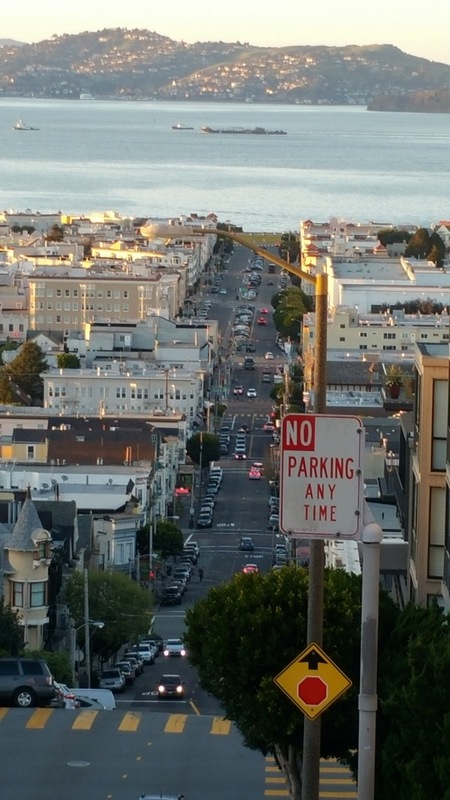 At sunset I thought of the day travelers who visit or work in the city. 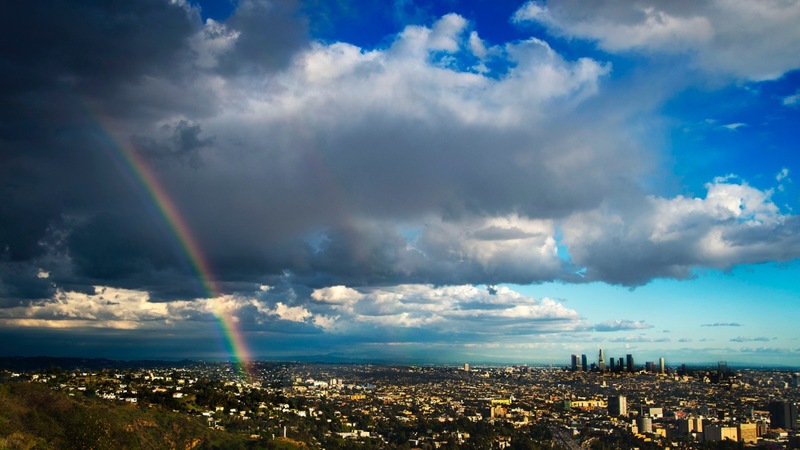 PHOTOGRAPH: “Rainbow over Los Angeles, California” by Jerry Garcia. 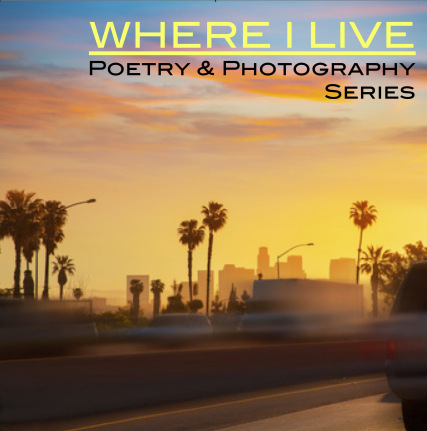 ABOUT THE AUTHOR: Jerry Garcia is a poet, photographer, and filmmaker from Los Angeles, California. 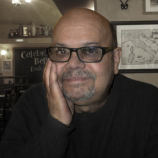 His poetry has been seen in a variety of journals, including Chaparral, The Chiron Review, Askew, Lummox, Palabra Magazine, poeticdiversity, The San Pedro River Review, and his chapbook Hitchhiking with the Guilty. Visit him at gratefulnotdead.com. You prayed it wouldn’t be the big one. Is it over? Your body is tight. from under the bed that didn’t collapse. though you can’t say why. It is stillness after something profound. And there they are, howling again, an aftershock. besides your peace of mind, has been rattled. door ajar, a mess of food spilled on the floor. headlands, a bay filled with sails, no tornadoes, no snow. This wasn’t the punch kind, delivered by a subterranean fist. This one, more lurch, then twist, and then the crashing starts. the ceiling dust. There are cracks on the walls that will stay that way. NOTE FROM THE AUTHOR: I love living in Northern California in spite of the fact that the earthquake risk hangs in the back of my consciousness. My first earthquake experience was in Ann Arbor, Michigan, and couldn’t figure out why things were gently trembling. Since moving west in 1984, I have been through enough to know that the house could fall. It’s been quite awhile since the last one, and my emergency supply of water has expired. (There’ usually a run on the preparedness stuff right after the stronger ones.) It was interesting to write about what it’s like at the time, and a reminder about how the cracks remain. PHOTOGRAPH: “Filmore Street at Broadway” (San Francisco, California) by Phyllis Klein. ABOUT THE AUTHOR/PHOTOGRAPHER: Phyllis is a California transplant from New York via Michigan. Visit her at phyllisklein.com. abandoned in a mermaid’s comb. their shingles tightly against the heat. SOURCE: “Low Tide” appears in Ruth Bavetta‘s poetry collection Embers on the Stairs (Moon Tide Press, 2014). NOTE FROM THE AUTHOR: My grandmother had a tiny cottage just few steps from the sand in Laguna Beach, California. Spending time there as a child and young adult forever tied me to the smell of salt and seaweed, the sound of the waves, the sparkle of the afternoon sun on blue. 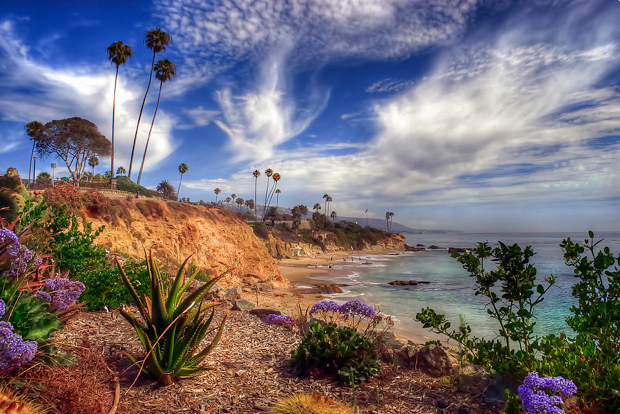 PHOTOGRAPH: “A Day in Laguna Beach” by Sean Foster. Prints available at fineartamerica.com. ABOUT THE AUTHOR: Ruth Bavetta’s poems have been published in Rhino, Rattle, Nimrod, Tar River Poetry, North American Review, Spillway, Hanging Loose, Poetry East, Poetry New Zealand and numerous others, and are included in the anthologies Wait a Minute; I Have to Take off My Bra, Feast, Pirene’s Fountain Beverage Anthology, Forgetting Home and Twelve Los Angeles Poets. She has published two books, Fugitive Pigments and Embers on the Stairs. A third book, No Longer at this Address, will appear soon. Visit her at ruthbavetta.com. And step onto the raft of sleep. 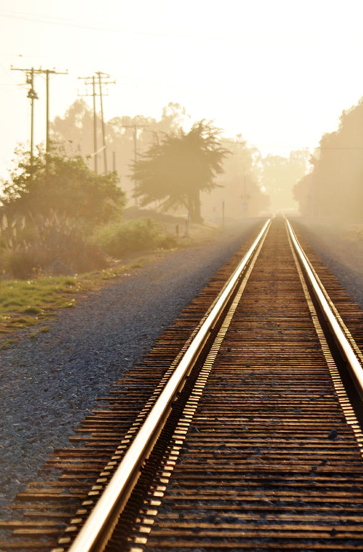 PHOTOGRAPH: “Train Tracks” (Carpinteria, California) by Kyle Hanson. Prints available at fineartamerica.com. shaded a light blue on the television. the door with the half-moon window. on days like today—a birthday, our son’s. without a promise sliding out. Best father. Best husband. Provider. Protector. You’ll never have to worry, I said. And on that morning I meant what I said. And I may not be back this winter after all. NOTE FROM THE AUTHOR: I wrote this poem about my home but from the perspective of someone escaping from some other place and some other life. 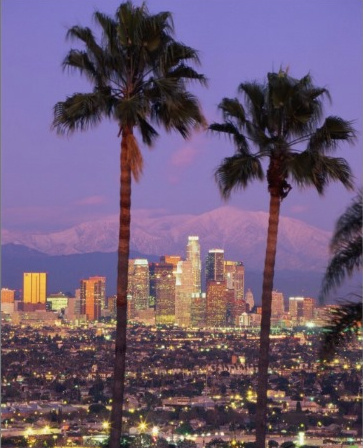 PHOTOGRAPH: “Two Palm Trees with Los Angeles in Distance” — postcard available at zazzle.com. 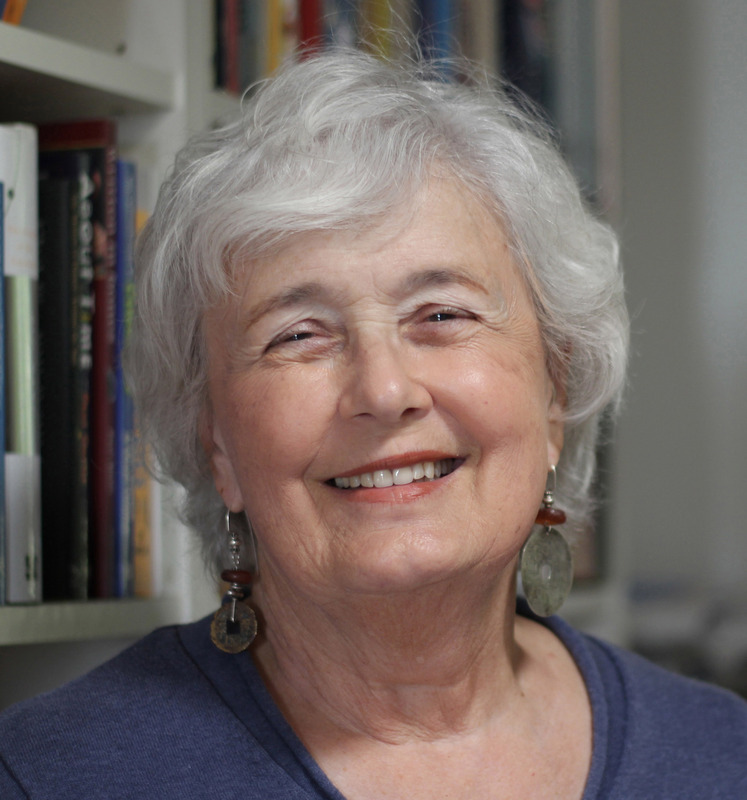 ABOUT THE AUTHOR: Rebecca Guess Cantor writes about names and naming, literature, women’s issues, and women in the Bible, among other subjects. 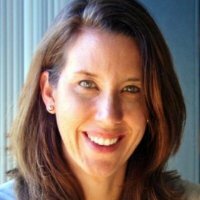 She received her Ph.D. from Claremont Graduate University in 2011 and is currently the Director of the Writing Center at Azusa Pacific University. Rebecca’s work has appeared in journals including Two Words For, Mezzo Cammin, The Cresset, and The Lyric. 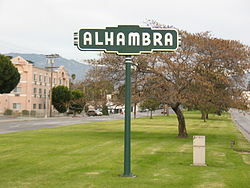 PHOTOGRAPH: “Alhambra Welcome Sign” by Magnus Manske. ABOUT THE AUTHOR: Don Kingfisher Campbell, MFA (Antioch University, Los Angeles), multi-award-winning poet listed on the Poets and Writers website, has been the long-time Creative Writing instructor for the Occidental College Upward Bound program, a coach and judge for Poetry Out Loud, a performing poet/teacher for Red Hen Press Youth Writing Workshops, Los Angeles Area Coordinator and Board Member for California Poets In The Schools, publisher of the San Gabriel Valley Poetry Quarterly, leader of the Emerging Urban Poets writing and Deep Critique workshops, organizer of the San Gabriel Valley Poetry Festival, and host of the Saturday Afternoon Poetry reading series in Pasadena, California. For publication credits, please go to: http://dkc1031.blogspot.com. against which the night’s flickering haze hangs. that the distance is not so great. a life reaches to its end. I am the current’s cold requiem. The ocean is our stone. MORE: Listen to Brad Rose read “Night Drowning Off Santa Monica” at soundcloud.com. NOTE FROM THE AUTHOR: Many, many years ago, I lived in Santa Monica. I would often surf there, and points north (Zuma, Malibu, etc.). When, 35 years later, I wrote “Night Drowning Off Santa Monica,” which is about love, loss, and mortality, my surfing experience in the Pacific informed the images contained in the poem. 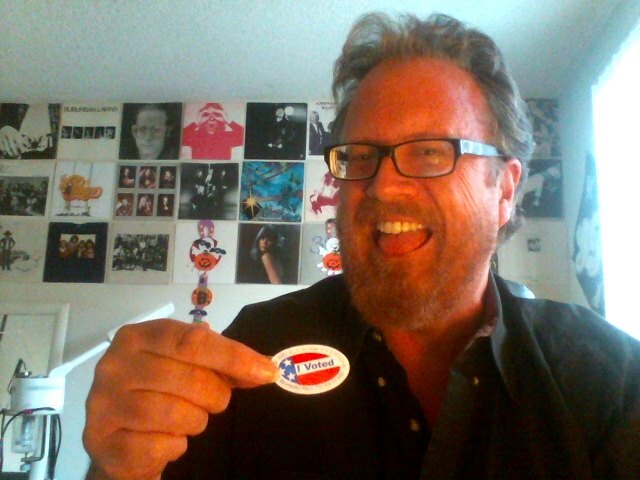 Although I’ve been a Boston resident for 30 years, I am inexorably, indeed, inescapably, a southern Californian. Our species’ origin may be in the sea. For the poem’s speaker, so, too, is his/her destination. 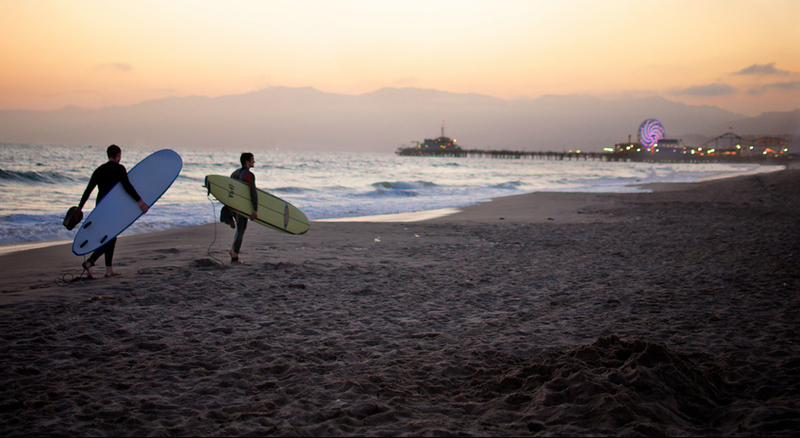 PHOTOGRAPH: “Beach After Sunset” (Santa Monica, California) by Nelson M.
Do we know of the bones on which we tread? Do we care about the lives we press up against? As we hurry the city through plates of glass and rail? 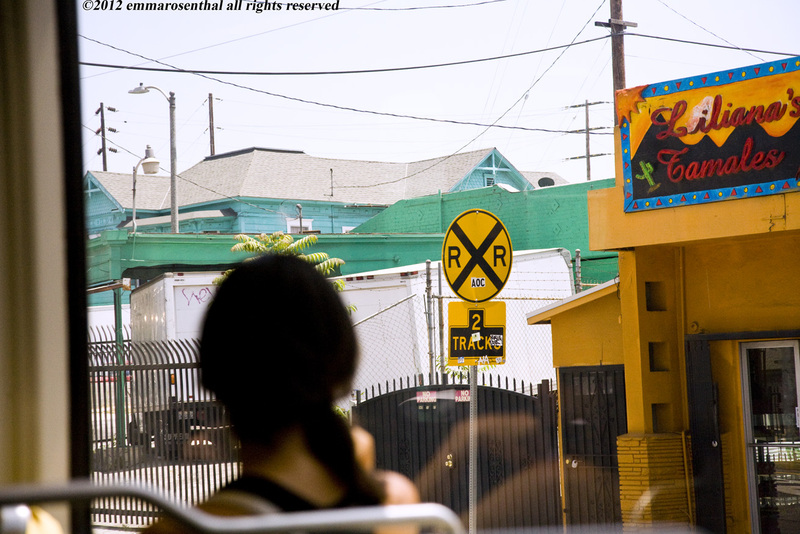 PHOTOGRAPH: “Metro Goldline, Boyle Heights” (6/14/12) from the series: L.A. Paradise Chimera: Gold Rush by Emma Rosenthal. ABOUT THE AUTHOR/ PHOTOGRAPHER: Emma Rosenthal is an artist, writer, educator, urban farmer, human rights activist, and award winning emerging photographer living in Southern California. Her work combines art, activism, education, and grassroots mobilization. As a person with a disability, she is confined, not by her disability but by the narrow and marginalizing attitudes and structures of the society at large.¶ Her work combines art, activism, education, and grassroots mobilization. And is impassioned, sensual, political, life-affirming, and powerful. She explores the use of art and literary expression to elicit an ethos more compelling than dogma and ideological discourse, providing new paradigms for community, communion, connection, and human transformation.¶ She has been a featured poet and speaker throughout Southern California at a variety of venues and programs including; The Arab-American Festival, Highways Performance Space, The Autry Museum, Barnes and Noble, Poetic License, Borders/Pasadena, Beyond Baroque, Freedom Fries Follies (a fundraiser for The Center for the Study of Political Graphics), KPFK, Arts in Action, Chafey College, UC Irvine, Pasadena City College, and Hyperpoets. ¶ Her work has appeared in several publications including Lilith Magazine, The Pasadena Star News, The San Gabriel Tribune, The San Gabriel Valley Quarterly, LoudMouth Magazine (CSLA), Coloring Book; An Eclectic Anthology of Multicultural Writers (Rattlecat Press 2003), Muse Apprentice Guild, and Shifting Sands, Jewish-American Women Speak Out Against the Occupation. Her work has shown in several galleries in the Southern California area, including the Galleries at Whittier College (Light Among Shadows: Human Rights Heroes) and Pasadena City College, as well as Beans and Leaves Coffeehouse in Covina, California. Find more of her work at smugmug.com. 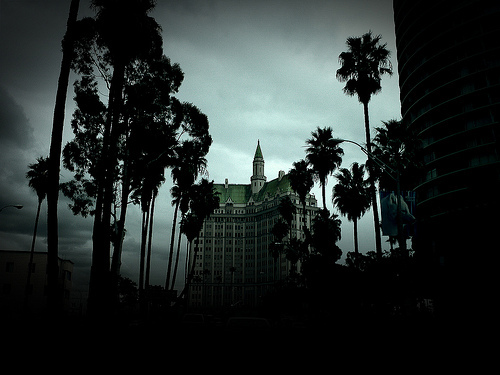 out at the downtown Long Beach, California, cityscape. fat with enough pink blossoms to polka-dot a yellow brick road to Hawaii. dread and dare demons to impale upon the spiked turrets. the Pacific Ocean sand, everyone in the world wondering: What’s next? leans, sighs, at whatever in her 1926 cityscape makes her remember and see. 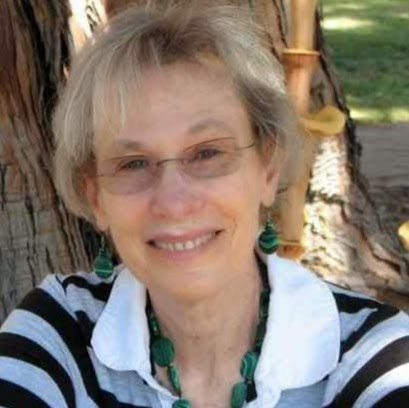 ABOUT THE AUTHOR: Joan Jobe Smith, founding editor of Pearl and Bukowski Review, worked for seven years as a go-go dancer before receiving her BA from CSULB and MFA from University of California, Irvine. 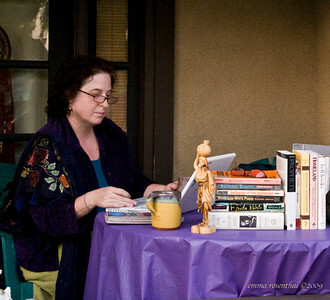 A Pushcart Honoree, her award-winning work has appeared internationally in more than five hundred publications, including Outlaw Bible, Ambit, Beat Scene, Wormwood Review, and Nerve Cowboy—and she has published twenty collections, including Jehovah Jukebox (Event Horizon Press, US) and The Pow Wow Cafe (The Poetry Business, UK), a finalist for the UK 1999 Forward Prize. In July 2012, with her husband, poet Fred Voss, she did her sixth reading tour of England (debuting at the 1991 Aldeburgh Poetry Festival), featured at the Humber Mouth Literature Festival in Hull. 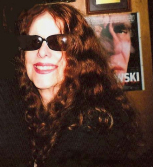 She is the author of the literary memoir Charles Bukowski Epic Glottis: His Art & His Women (& me) (Silver Birch Press, 2012). Her writing is featured in LADYLAND, an anthology of writing by American women (13e note Éditions, Paris, 2014). Her poem “Uncle Ray on New Year’s Day . . .” won the 2012 Philadelphia Poets John Petracca Prize.